The Persian Empire, about 500 BC; Persis is the central southern province with the red outline. Its main cities are Persepolis and Pasargadae. For other uses, see Persis (disambiguation). Seal of Darius the Great hunting in a chariot, reading "I am Darius, the Great King" in Old Persian (𐎠𐎭𐎶𐏐𐎭����𐎼𐎹𐎺𐎢𐏁𐎴 𐏋, "adam Dārayavaʰuš xšāyaθiya"), as well as in Elamite and Babylonian. British Museum. 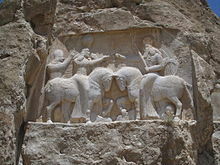 The ancient Persians were present in the region of Persis from about the 10th century BC. They became the rulers of the largest empire the world had yet seen under the Achaemenid dynasty which was established in the late 6th century BC, at its peak stretching from Thrace-Macedonia, Bulgaria-Paeonia and Eastern Europe proper in the west, to the Indus Valley in its far east. The ruins of Persepolis and Pasargadae, two of the four capitals of the Achaemenid Empire, are located in Fars. The Achaemenid Empire was defeated by Alexander the Great in 330 BC, incorporating most of their vast empire. Several Hellenistic satraps of Persis are known, following the conquests of Alexander the Great, from circa 330 BC, especially Phrasaortes, who ruled from 330 to 324 BC, Oxines who usurped his position and was then executed by Alexander, and the Macedonian general Peucestas, who learned the Persian language and followed local customs, implementing a persophile policy. Peucestas retained the satrapy of Persis until the Battle of Gabiene (316 BC), after which he was removed from his position by Antigonus. A short period of Antigonid rule followed, until Seleucus took possession of the region in 312 BC. When the Seleucid Empire was established, it possibly never extended its power beyond the main trade routes in Fars, and by the reign of Antiochus I or possibly later, Persis emerged as a state with a level of independence that minted its own coins. During an apparent transitional period, corresponding to the reigns of Vādfradād II and another uncertain king, no titles of authority appeared on the reverse of their coins. The earlier title prtrk' zy alhaya (Frataraka) had disappeared. Under Dārēv I however, the new title of mlk, or king, appeared, sometimes with the mention of prs (Persis), suggesting that the kings of Persis had become independent rulers. Babak was the ruler of a small town called Kheir. Babak's efforts in gaining local power at the time escaped the attention of Artabanus IV, the Arsacid Emperor of the time. Babak and his eldest son Shapur managed to expand their power over all of Persis. Ardaxšir (Artaxerxes) V, defeated the last legitimate Parthian king, Artabanos V in 224 CE, and was crowned at Ctesiphon as Ardaxšir I (Ardashir I), šāhanšāh ī Ērān, becoming the first king of the new Sasanian Empire. Artabanus marched a second time against Ardashir I in 224. Their armies clashed at Hormizdegan, where Artabanus IV was killed. Ardashir was crowned in 226 at Ctesiphon as the sole ruler of Persia, bringing the 400-year-old Parthian Empire to an end, and starting the virtually equally long rule of the Sassanian Empire, over an even larger territory, once again making Persia a leading power in the known world, only this time along with its arch-rival and successor to Persia's earlier opponents (the Roman Republic and the Roman Empire); the Byzantine Empire. The Sassanids ruled for 425 years, until the Muslim armies conquered the empire. Afterward, the Persians started to convert to Islam, this making it much easier for the new Muslim empire to continue the expansion of Islam. Persis then passed hand to hand through numerous dynasties, leaving behind numerous historical and ancient monuments; each of which has its own values as a world heritage, reflecting the history of the province, Iran, and West Asia. The ruins of Bishapur, Persepolis, and Firouzabad are all reminders of this. Arab invaders brought about a decline of Zoroastrian rule and made Islam ascendant from the 7th century. Wikisource has the text of the 1911 Encyclopædia Britannica article Persis. ^ Richard Nelson Frye (1984). The History of Ancient Iran, Part 3, Volume 7. C.H.Beck. pp. 9–15. ^ a b Dandamaev, Muhammad A.; Lukonin, Vladimir G. (2004). The Culture and Social Institutions of Ancient Iran. Cambridge University Press. pp. 1–5. ISBN 9780521611916. ^ Roisman, Joseph (2002). Brill's Companion to Alexander the Great. BRILL. p. 189. ISBN 9789004217553. ^ a b Curtis, Vesta Sarkhosh; Stewart, Sarah (2010). The Age of the Parthians. I.B.Tauris. p. 38. ISBN 9780857710185. ^ a b PEUCESTAS – Encyclopaedia Iranica. ^ Kaveh Farrokh (2007). Shadows in the Desert: Ancient Persia at War. Osprey Publishing. pp. 176–9.